Do you guys ever have a good experience on the lots?? I start sweating and feel like I’m gearing up for Great American Warrior. Anyone else need to psych themselves up for this?! At any rate, we walked in the dealership on a mission to find a specific truck that Neil poured over for hours (days, weeks, years even!). And who knows what else was on the wish list. As long as it had AC and a Backup Camera in case I ever had to drive it!! In walks our salesperson who says that the particular truck he wants to see is actually at the mechanic. Wait…he finishes…at the mechanic for a new set of tires! Hmm, it’s sounding more intriguing. He sends us off to lunch and then to come back in a bit and it would be ready to test drive. 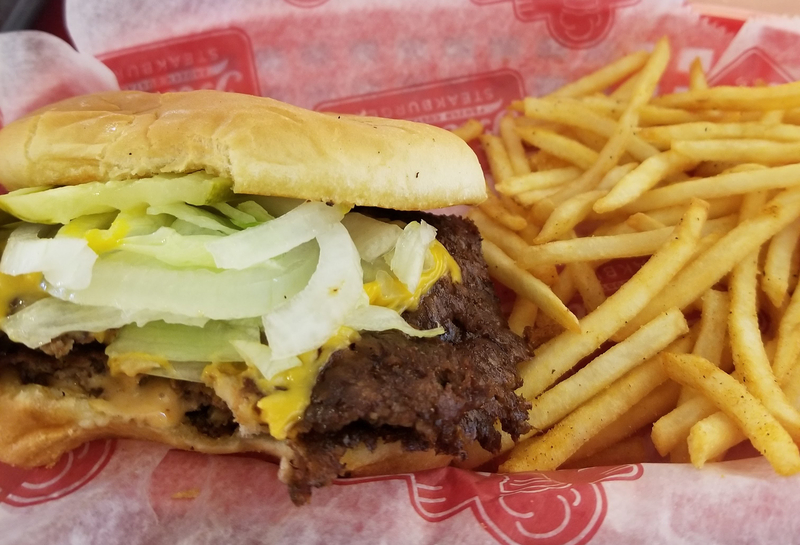 We head over to Freddy’s Steakburgers since neither of us had ever been there. #1 at Freddy’s with fries!! YUM! Ok, so we try Freddy’s. Pretty tasty! We didn’t get to try the custard because we were WAY to full to even consider it after the burger and salty, skinny shoestring fries! The fry sauce was pretty good too, I couldn’t decide if I liked the regular or jalapeno one better, but …mix em up and throw em on your burger! Not bad!! After our lunch we head back to the dealership and find our salesperson. The truck is ready to drive! Neil takes it for a spin and I stay back because I’m researching other trucks to see afterwards and hopefully compare! This next place was a total strike out too. Full size truck and comparable mileage, but definitely not as pretty nor as well taken care of. Neil equaled…not impressed. By this time, it was time to pick up Kaya from “school” and trudge through the concrete jungles we call “our route home” to think over both options more in depth. Some might say “sleeping on it”. Somewhere in the back of my mind, and knowing I won’t stop, I know we’re driving to a kitchen with close to nothing in it to throw together, two and a half pounds of ground beef that needs to be cooked FAST before it goes bad and bellies full of steakburgers already…dilemma. Some might say, go ahead and skip that meal. Check out Part Two with a RECIPE and leave your car shopping stories in the comments!